It all started with the bidding on a precious book, banned by the government. Irene is determined to obtain the book for the Library while Charles Melancourt wants the book for a Russian buyer. Unfortunately, things quickly get complicated. Kai is supposed to meet with Peregrine Vale, a fellow fighter of crime and a friend. Instead, he runs into a trap and finds himself bound. Meanwhile, Irene is determined to find him- even if it costs her the position of Librarian that she values so highly. Irene will have to sift through the various Fae intrigues if she hopes to rescue Kai…. 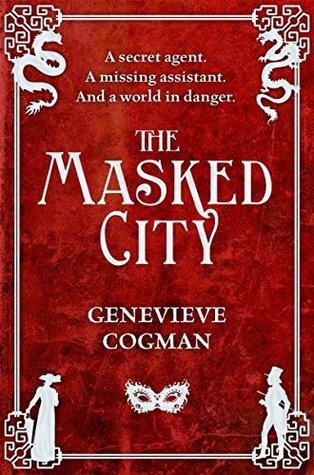 THE MASKED CITY is the second book in Genevieve Cogman’s The Invisible Library series but can easily be read as a standalone. As much as I enjoyed the first book, THE INVISIBLE LIBRARY, this second book simply blew me away! My only complaint- and it’s a very small one- is that we got less time with Kai since he spent most of the book in kidnapped status. Genevieve Cogman expands on the world building in THE MASKED CITY and I love the potential I see for future books in this series as well. The Library allows its librarians so basic resources that are typically at their disposal, but THE MASKED CITY turns all of that upside down. We get a lot of insight into the Fae world and the conflict exists internally. Even more intriguing, however, are the glimpses we get of the dragon’s world and I sincerely hope we get to see more of this in the future. However, as much as I love the depth and complexity of the world building, it is the characters who truly make this series so enjoyable. Irene is a phenomenal heroine, both spunky and loyal to her friends. I love that she refuses to give up on Kai- and better yet, that Kai knows she won’t give up on him. Vale isn’t as prominent in THE MASKED CITY but he continues to fight for justice, even when the paths for him to help seem blocked. THE MASKED CITY solidifies my enjoyment of The Invisible Library series as I’m definitely hooked! Full of action, world building, and great character development, THE MASKED CITY is a fast paced read that keeps you rapidly turning the pages to see what will happen next. Highly recommended! This sounds so good! I just bought the first book in the series on Kindle, but haven’t had a chance to read it, yet! Glad to hear that you enjoyed the second book more! I hope you enjoy it even half as much as I did! I’m looking forward to the third book…..